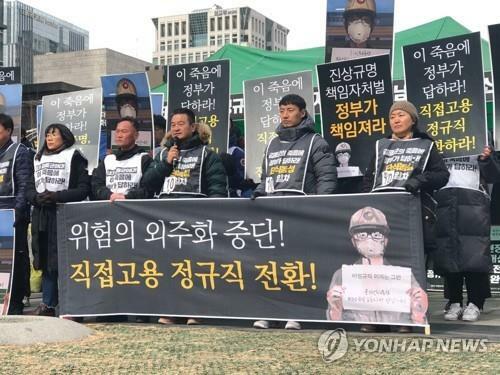 SEOUL, Feb. 5 (Yonhap) -- Officials from the government and the ruling Democratic Party (DP) agreed Tuesday to conduct an investigation into the death of a young contract worker at a thermal power plant in December, party officials said. Government and DP officials made the agreement Tuesday to operate a joint committee to look into the case and come up with a result by June 30, they said. Kim's funeral, meanwhile, will be held Thursday for a three-day run following the agreement, a civic group said. The funeral has been postponed for nearly two months as the civic group and his bereaved family have called for an investigation to uncover the truth about the accident and punish those responsible for his death.